Update: The latest round of patch notes are out, as well. Among the major changes are Lt. Morales getting a health buff from 700 to 840. Give the newest patch notes a look over at Battle.net. Original story: The Protoss are set to rise again in the upcoming StarCraft II: Legacy of the Void. 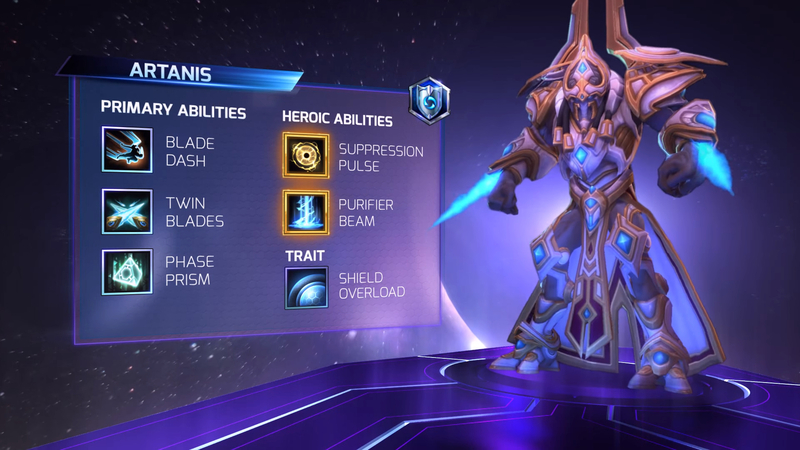 But before that time comes, Artanis is making his presence felt in Heroes of the Storm. In fact, anyone that's already purchased Legacy of the Void can pick him up today. What can Artanis players expect to see from the Protoss leader? His trait is called Shield Overload and it grants him a protective shield when his health goes below 50 percent. That should give some of his support teammates enough time to heal him up. Since Artanis is built to fight, doing so will reduce the cooldown of this ability. (Q) Blade Dash - Artanis dashes forward in a straight line to cut up his foes. He'll then dash back to his previous position, dealing more damage along the way. (W) Twin Blades - Artanis is armed with dual blades, enhancing his basic attacks. (E) Phase Prism - It's a dangerous switcheroo! Artanis tosses a phase prism in front of him. Any Hero that catches it will be phased towards Artanis, while Artanis moves towards that Hero's previous spot. Not only does it shuffle some pieces around, but Artanis will deal damage along the way. (R1) Suppression Pulse - This calls upon the Spear of Adun to deploy a net of energy. It doesn't deal too much damage, but will blind any enemy Heroes caught inside. The most dangerous part of Suppression Pulse? It has unlimited range, so Artanis can support his teammates from literally any position on the map. (R2) Purifier Beam - The Spear of Adun is called once again, this time to deliver a purifier beam. The beam will chase an enemy Hero, closing in like the Sword of Damocles, delivering heavy damage to anything it touches. Like Suppression Pulse, Purifier Beam can be called from anywhere on the map. Artanis is ready to spread the fear of the Protoss and Heroes of the Storm players can expect to find him in games today. But only those that have pre-purchased Legacy of the Void will get him for now. Everyone else will have to wait until next week to pick him up. For more, check out the video below.